Gus Gus is one of the main mice characters in Disney's "Cinderella" movie. Gus Gus is a great costume idea for Halloween and costume parties, especially as one of a group of costumes including other characters from "Cinderella." 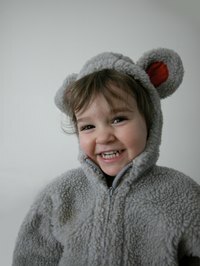 While it can be hard to find a store-bought Gus Gus costume, it is easy to make one at home. Measure the wearer's head with a measuring tape. Cut out two triangular pieces of green felt that are each 24 inches tall in the middle and 13 inches wide at the base. Lay the two triangular felt pieces directly on top of each other, right sides of the felt facing each other. Sew the felt pieces together along the longer edges so that the circumference corresponds with the head measurement. Leave the shorter edge open. This will form the hat. Fold over the raw edges of the hat 1/4 inch and iron the folds down. Fold the edges over 1/4 inch more and sew the folds in place. Cut out two circular pieces of brown felt that are each 6 inches in diameter. These will form the ears. Cut out two circular pieces of pink felt that are each 4 inches in diameter. Hot glue these pink circles to the middle of each of the brown felt ears. Hot glue one ear to each side of the hat. Cut out a piece of brown felt that is 30 inches long and 3 inches wide. Sew the long edges of the felt piece together, forming a felt tube. This will form the tail. Sew one of the ends of the tail closed and turn it right side out. Fill the tail with stuffing, using a yardstick to help push the stuffing as far into the tail as possible. Sew the remaining open edge to the seat of a pair of brown sweat pants. Pair the hat and sweat pants with a yellow T-shirt. Paint a red circle on the tip of the nose and three black whiskers on each cheek, using face paint or other makeup.